Can you imagine a hostile foreign navy just a few miles off the Italian coast, threatening not only to destroy Rome, but to wipe out Christianity in Italy and perhaps in all of Europe? This was the situation facing Pope St. Pius V in the autumn of 1571.Word had come that a huge navy from Turkey was on its way to try to add Italy to the Ottoman Empire and to make all Christians into Muslim slaves. On October 7, the Rosary Confraternity of Rome met at the Minerva, the church that served as Dominican headquarters, to recite the Rosary for a Christian victory over the Turkish navy. Meanwhile, in Venice, a Christian navy with ships from Venice, Naples, Genoa and Spain assembled under the leadership of Don John of Austria. They engaged the Turkish fleet on October 7 and routed the enemy in a sea battle near Lepanto, on the Greek coast. The Holy Father attributed the victory to Our Lady’s intercession after the campaign to pray the Rosary in Rome. He made October 7 into a feast day honoring Our Lady of Victory (the day was later changed to the Feast of Our Lady of the Most Holy Rosary). Pope Pius V came by his Marian devotion naturally: before being made pope, he had been a Dominican friar. Born Anthony Ghislieri on January 17, 1504, he entered the Dominican Order at age fourteen, taking the religious name Michael. After his religious profession and ordination he became a lecturer in philosophy and theology, but his fine orthodox scholarship soon brought him to the attention of Pope Paul IV, the first great pope of the Catholic Counter Reformation. The future Pope Pius became active in working for the reclamation of the Catholic faith from doctrinal attack. As his Church career continued, he was made first a bishop and then a cardinal; he was elected pope in 1566. From his Dominican training, Pope Pius brought to the papal household a monastic austerity and certain customs which survive to this day, such as eating some meals in solitude and making these private meals more frugal. Pope Pius V strengthened the Church during the difficult years following the Protestant Reformation. Notably, he was the Pope who excommunicated Queen Elizabeth I of England. He channeled all his energy into preserving the unity and integrity of the faith in Italy and to eliminating abuses such as absentee bishops. Such efforts on behalf of the Church resulted in attempts on his life. In pictures of St. Pius, he is sometimes depicted kneeling before a crucifix, the feet of which are withdrawn to avert his kiss. The story is told of how one day an enemy had placed poison on his crucifix. When the Pope moved to venerate it, the feet of the corpus moved from its place. 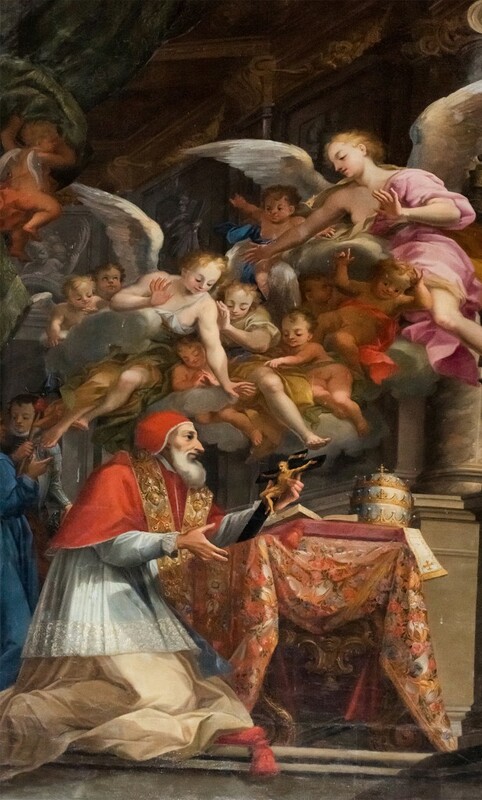 With a great love for the Holy Sacrifice of the Mass, Pope Pius V unified the liturgy by standardizing the Roman Breviary and the Missal, thus allowing for uniform recitation of the Office and celebration of the Mass. He oversaw the publication of the definitive Latin catechism decreed at the Council of Trent. Fittingly, he declared St. Thomas Aquinas, his great predecessor in the Dominican Order, a Doctor of the Church in 1567, and in 1570 he sponsored an edition of St. Thomas’ complete works. Pope Pius V’s greatest dream, however, was to found a Holy League for a Crusade to defend Christianity, and this dream was realized at the Battle of Lepanto. The victory there over the Turkish threat remains the source of this pope’s popular fame, and gave the Church not only the feast day on October 7 but also the tradition of dedicating the entire month of October to Our Lady of the Rosary. In 1588, Pope Sixtus V had the remains of Pope Pius transferred to the Basilica of St. Mary Major in Rome, a permanent tribute to Pius’ love of the Blessed Mother and her Rosary.